I used my trouser block draft from my previous post to (mostly) successfully alter a Patrones pattern to fit me straight up! Cue crazy happy dance!!! I bought this Patrones magazine (issue 317 – June 2012) after seeing it on Mel’s blog (The Curious Kiwi), because I fell wildly in love with those pink shorts that are pattern #7. It’s only taken me two summers to actually get around to sewing them. My hip and waist measurements matched the Patrones size 44. So I traced that one out and placed the pieces over my trouser block – turns out I’m a Patrones 44 at the hips, but a 48 at the location of the pattern’s waist. I then basically re-drafted the pattern pieces to match the shape of my block. The muslin I then made up of these shorts fit perfectly, first time. I then halved the width of the waistband – it just looked a little out of proportion on me at the height you see in the magazine pictures above. 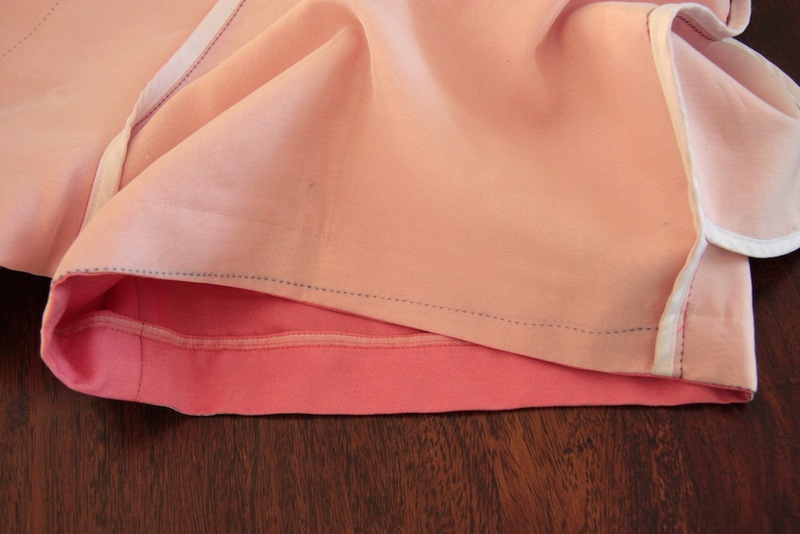 And the fabric I’ve had kept specially for these – a hot-house pink silk twill from The Fabric Store. It’s lovely stuff – beautiful sheen and incredibly soft and smooth, yet so strong! I ended up sewing these using ‘couture’ methods, mainly because after throwing the silk twill in the washing machine, it dried incredible creased. I was kind of hoping that the silk organza underlining will mitigate a small portion of the propensity to crease to make ironing them a little bit easier! I’ve worn them a few times now and this has definitely helped. That did cause some headaches (mostly of my own causing) because of the cuffs – which you can’t exactly fold up when you’ve got an organza underlining. 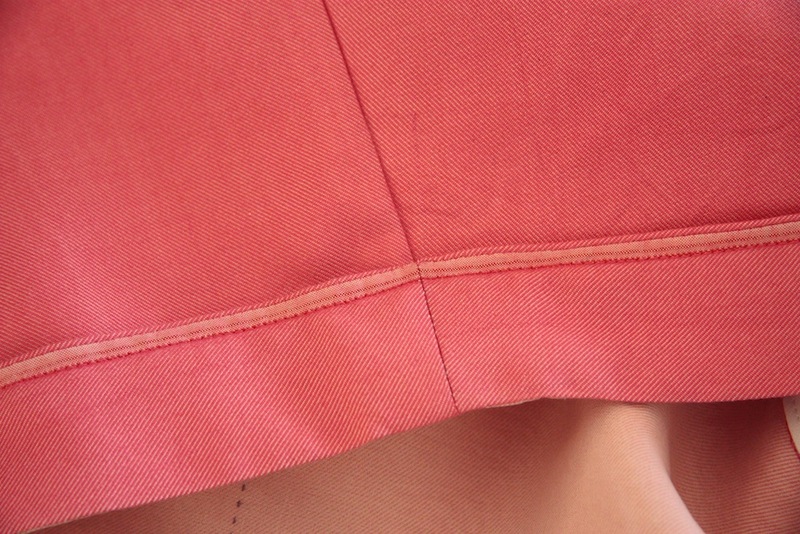 Also, the twill is pale pink on the reverse side, which I didn’t really feel like having visible. Aaaand I wanted to incorporate a bit of the selvedge, because it would add the kind of subtle detail I love in a self-sewn garment. So I drafted a cuff with a facing to hide the selvedge fringe, which was sewn on then stitched in place in a dark pink thread – I’m really happy with the result. I tacked the cuff at both the outerseam and inner seam to keep it in place. Otherwise this sew was pretty uneventful. 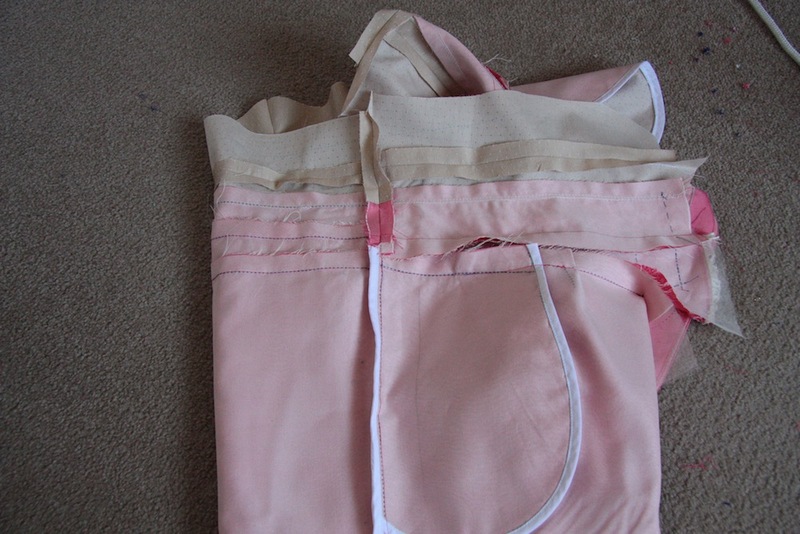 I also made my own binding – pre-wedding dress I was all about using the ‘Hug Snug’ rayon seam binding, and all my favourite dresses have their seams bound with that. It doesn’t wear as well as I would like it too though, so I’m either going to have to finally buy an overlocker, or make my own seam binding. As we’re saving like crazy so we can buy a house right at the moment, it’s the DIY option for now. 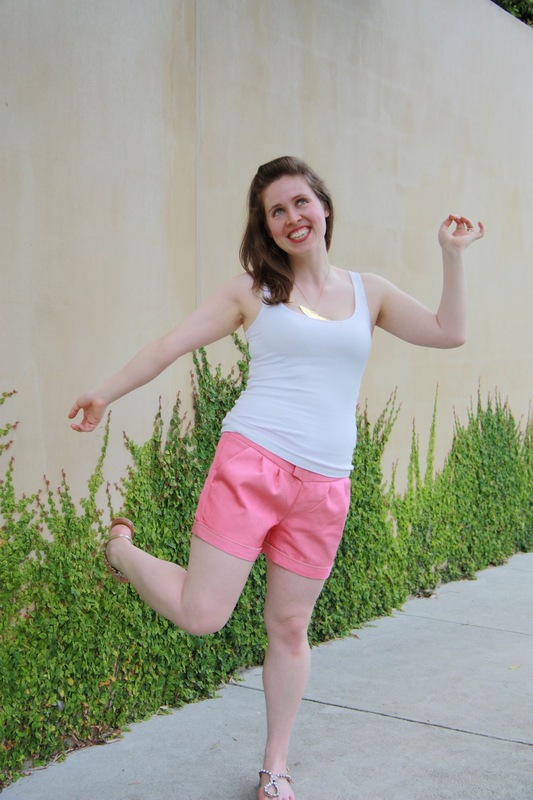 I did take complete advantage of the one benefit of having flat hips – these shorts don’t have a proper fly, they are sewn right up to the point where the waistband joins at the front. 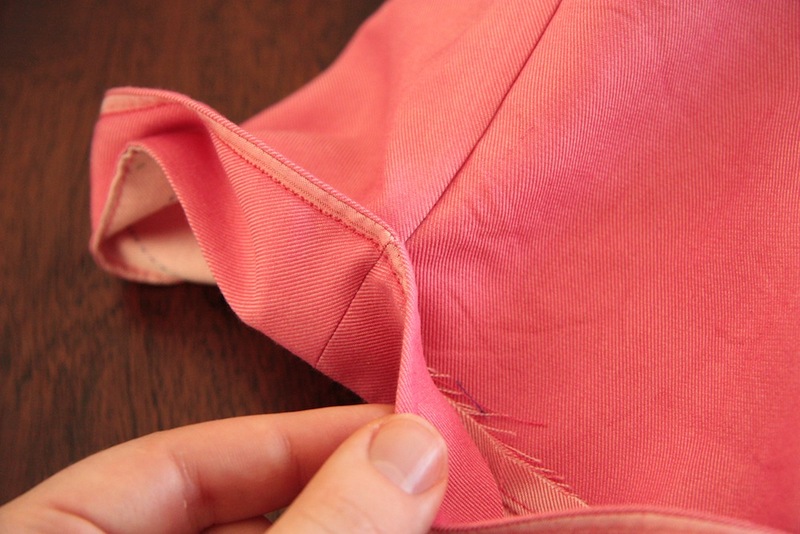 The shaping of the waistband basically is what is holding them up. I can quite easily shimmy them on without a whisper of strain on that seam! I’m a bit of a weight fluctuator. So in anticipation of this, I’ve sewn the waistband so it can be relatively easily altered, similar to that of men’s trousers. This way, I can unpick the waistband facing, take them in, then join the waistband back by stitching in the ditch. However, I’m going to take a guess that the likelihood of me actually bothering to do that is extremely low. In hindsight maybe I should have left the giant waistband be and had a matching belt made up, like they do in the magazine. Next time! The fit of these shorts far eclipses the fit of shorts I’ve made previously, and they are both smart looking and ridiculously comfortable. So I’m really just over the moon! The style definitely suits a stiff and fairly substantial fabric though – the organza really helped there as my twill is more floppy than crisp. I’m wondering if these would translate well as a pair of winter shorts, made up in a heavy-ish tweed and worn with tights? But the weather has been warming up delightfully and sewing for winter is far from my thoughts. If a sew another pair of these (perhaps in a print?) and buy another singlet top or two – there’s my 2014/2015 casual summer uniform pretty much complete! Beautiful! That pink colour suits you very well. I’m very jealous you can go without a fly – there is no way I’d get my child bearing hips into shorts without one! I also need some singlets – where do you buy yours from? Thanks for the tip about Sherry’s blog Mel. I am thinking of making them too – the ones I like are $65 a pop, which seems silly for a singlet…. Yeah, that’s way to exxy for a singlet. I think I’ll probably be sewing them too, because my sewing laziness is not yet outweighed by my shopping laziness. I find that refreshing to know. These look super sweet, lovely colour and the polka dot internals are darling. All that work has once again paid off; these shorts are really nice and look perfect on you. I have 3 Patrones magazines which were sent to me by the lovely Merche and I am yet to use them. I don’t read Spanish so I have been reluctant to use them. Obviously it didn’t bother you Mel and you just got in there and made the shorts. Did you need to get any help or are these magazines similar to how you use a Burda magazine?? Thanks Mel. I never thought that it could be Portuguese. I should just do it too as there are several really lovely tops that I would like to make. Google translate usually has me scratching my head and laughing madly. Nothing is ever simple with you is it!!! But that’s why I LOVE reading your blog. Those shorts are just fab. I love the cuff detail – really clever and looks great. And of course I always love looking at all the details of inside – I do aspire to sew more like you. OMG. Couture shorts!!! Who would have ever thunk it? But you did it, Mel, and beautifully as always. You amaze me! Thanks Cissie! I absolutely love these shorts. I’m beginning to realise I’m not capable of going back to non-couture sewing. I sewed up a shirt muslin over the weekend using seam allowances and it really irked me… it just doesn’t look as good!! Why yes, underlining shorts with silk organza makes perfect sense. Maybe not to ordinary, RTW-type people, but it does to those of us who have entered “THE COUTURE ZONE.” (And you know who you are…) Wear them with pride! Your shorts are beautiful inside and out – and luxurious too with all of the couture detailing! Normally a post about shorts would not do too much for me, but these are definitely not normal shorts! Couture shorts, with clever and unique cuffs – these are simply the best, and I love the color! Cute shorts. They are going to serve you well during summer. Couture shorts. They could only be made by you :) And of course the result is beautiful! They look fantastic on you and such a good fit. I love the insides of your clothes, I tend to use my overlocker on everything and it’s nowhere near as pretty as bound seams! I guess both finishing means have their charms :) Thanks Suzy! They look great. Organza underlining on shorts is lovely but pretty extravagant! A poplin or cotton batiste will give structure to drill cotton just as well. Thanks Gail! Depends on how much you pay for your organza! ;) I bought a bolt of the stuff many moons ago, which makes it super easy because I already have it, and not badly priced per m either. Wow! 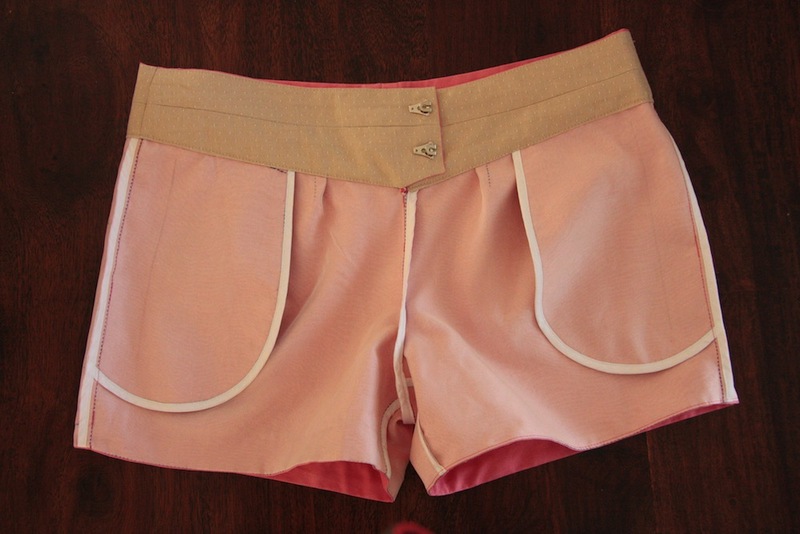 I want couture shorts… These are just gorgeous. Love the facing and top stitching, you’ve done a fantastic job. Mel, you had me at pink AND shorts. These are seriously fierce lady and the colour looks gorgeous on you! Sassy summer lady! Now, at the risk of sounding even more clueless than normal, when you attached the organza as underlining was this done when thread tracing your seams (and is that how it stays flush with the shell fabric)? Every time I have tried to underline (and this was a ways ago) it never stayed snug and it ended up all levels of ugh… Advice/pro-tips/cake welcome! Ahhh! Top tip! Thank you, my pink shorted friend! Great job. Your work in pant drafting paid off. Lovely finishing work inside and the underlining makes perfect sense to couture sewers. A winter pair in wool would be fabulous. These are so sassy and fun!!! Love that gorgeous shade of pink! And, as always, all your attention to detail is just astounding! Such fancy shorts! I really like your cuff treatment. And whoopee for comparing the pattern to your block! I’ve been doing that for bodices and it can really spotlight major fit issues without a muslin. I like a giant waistband as much as the next person, but I think their belt loop placement in the magazine must have been a little awkward as the belt rides up in the front! All this is to say, I like your version sans belt. These are so cute! I love the color! And I can TOTALLY imagine a winter pair in tweed- that would look great on you! Immaculate! The seam matching, the seam binding, the whole shebang! Only you could make such great looking shorts with such precision. Such a pretty colour and I love the fabric you’ve gone with for the waistband – totally classic! 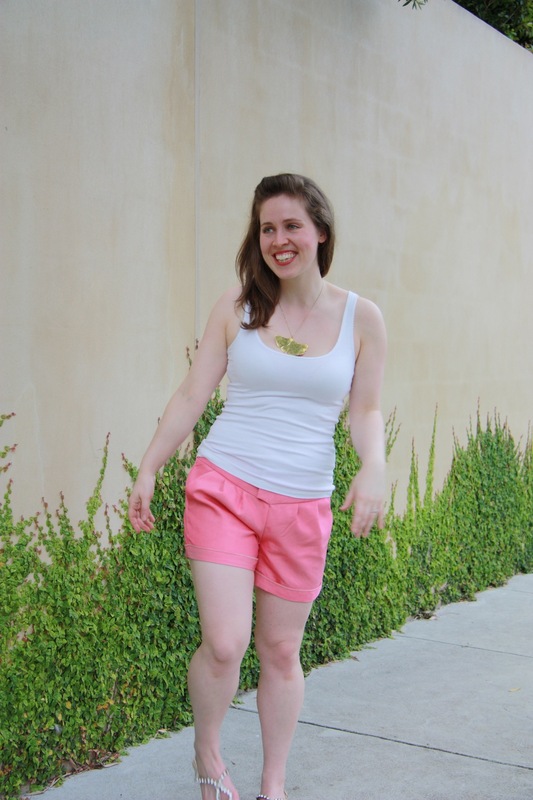 OMG I am super impressed that you made couture shorts, but so totally worth the fit and feel. I need to change my mind set and put this much effort into everything, then perhaps I won’t be so disillusioned my sewing. 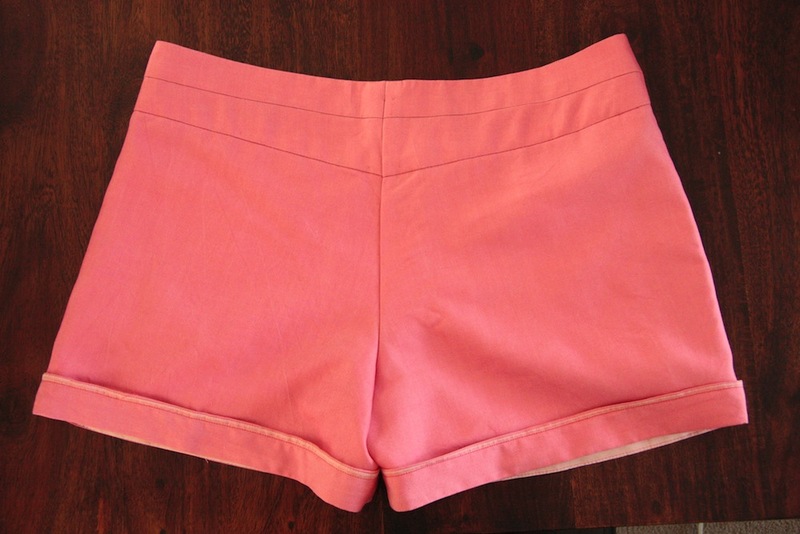 Put that winter pair of shorts on your list for next year, they will look amazing! i’ve always dreamed of making some winter shorts to wear with tights, but have never taken the plunge! this style would be perfect for that. love, love, love this bubblegum pink on you! so fun! i need to pick up some silk organza sometime, it just sounds heavenly as underlining. great job on these! I think they are as pretty on the inside as they are on the outside. I absolutely love the bound seams, they truely wouldn’t have been as lovely if they were overlocked. Fabulous shorts and pink too! Perfection!! I love all the details of these and your cuff treatment really makes them look professional. BTW if you are looking for singlet patterns Measure Twice has some. 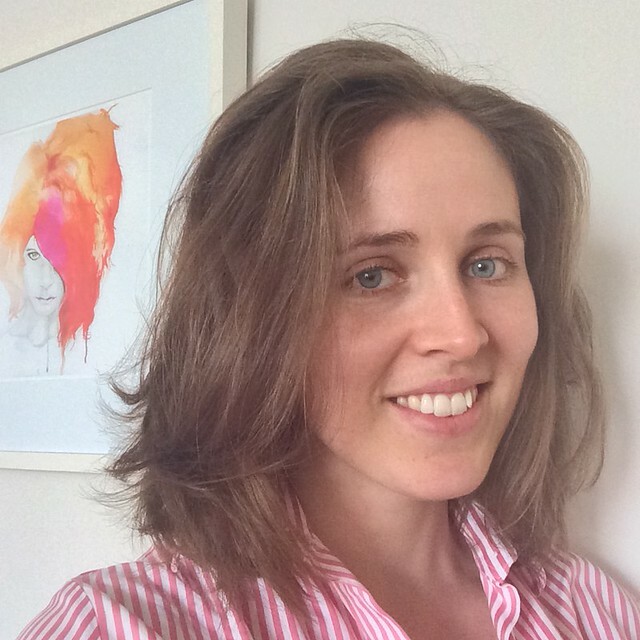 Funny you mention Susan’s patterns… I was just looking at her site last night! Just have to find an appropriate knit first, and that can be such a pain. Wow, those shorts are really fancy-shmancy , they look beautiful! OM couture shorts, how divine and they look perfect on you! So gorgeous and fits perfectly! 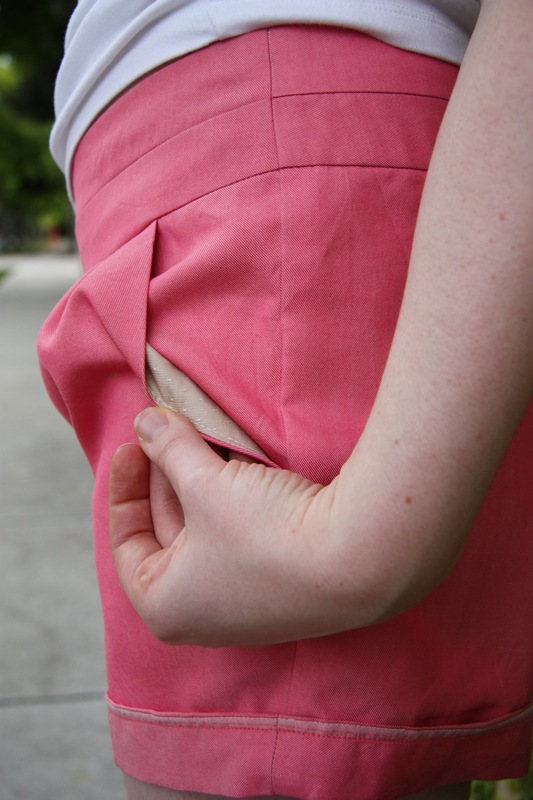 I can’t believe that you don’t have an overlocker! You deserve one with all your sewing that you do! Heck, I have two! Hahaha! Where did you buy those hook and eyes? They’re gorgeous!! Aren’t they just? Such lovely curved lines… and I have no idea. I was given them by someone and the label on the packet was ripped off… and I can’t even recall who! Clearly they’re an utterly fabulous person though. $100 for 2000 pieces. I like them enough that I’m considering it – they work wonderfully. Wanna see if anyone else wants in and we can split the order??? This UK place has them too! I love the elegant little details of this pattern, especially that waistband! One of these days I must try Patrones. 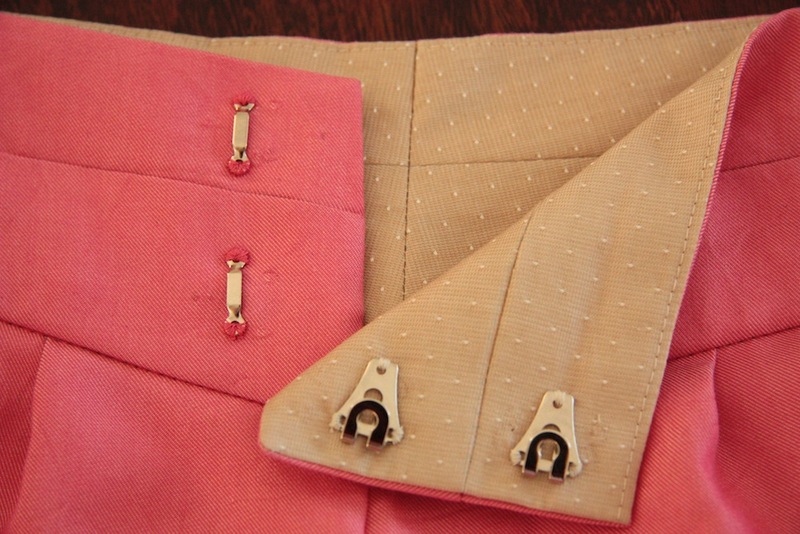 And oh my gosh I can so relate to the hook & bar sewing–I can’t count how many times I’ve sewn them on backwards or upside down.